GameYob is an open-source gameboy emulator for the DS. It has excellent compatibility and speed, and runs many games flawlessly. 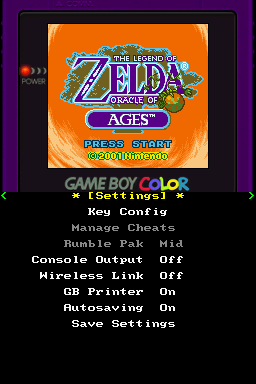 Notably, it can use the Gameboy Color bios to colorize pre-color games, just like on a real gameboy. - Updated to DevkitARM r46 for better DSi support. - Added an installable CIA file to run as DSiWare. - Certain 3DS-side launchers such as TWLoader now work again. - Added "touch" as a configurable button. - When running as a CIA on the New 3DS, the "touch" input gets spammed for no reason. It can now be disabled as a workaround. This file has been rated 5 out of 5 based on 11 ratings and 11 user reviews.